Pury End Bed and Breakfasts. Compare latest rates and Live availability for all your favourite places and places you have always wanted to go using our new My Shortlist feature. Click + to add to your Shortlist. 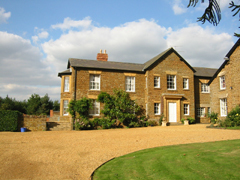 Bed and Breakfasts in Pury End, Northamptonshire for 1 night from Sun Apr 21, 2019 to Mon Apr 22, 2019 within 10 miles, in an Average Nightly price range of £1 to £200. Set in 8 acres with a lovely country garden Linford Stables bed & breakfast 8 miles from Milton Keynes is situated on the A421 Buckingham Road. This farmhouse style B&B is only 5 miles from the town of Buckingham and 11miles from auto racing at Silverstone. All rooms have colour TV free WiFi free tea & coffee fridge hairdryer & iron on request. Linford Stables farmhouse has 8 spacious ground floor double rooms 4 of which are ensuites with power showers. 3 of the 4 south facing Scandinavian style ensuite rooms that overlook the horse schooling arena have double beds one is a twin but all 4 are configurable as family rooms by adding an extra bed. They each have a mini fridge kettle for tea & coffee vaulted ceiling pine floor & beams plus their own direct access via South facing double leaf French doors. The remaining 4 double rooms share 2 bathrooms and use of the farmhouse kitchen for making tea & coffee. Breakfast is optionally available between 7 am and 9 am at our 6 person en famille dining table adjacent to the farmhouse kitchen and overlooking the garden. Our secure off-road parking area can accommodate 10 cars larger vehicles & horseboxes. Guests can relax in our country garden or wander down to the paddocks or stables to see our horses. We also provide stabling and B&B for horses and riders competing at nearby Addington Manor Equestrian Centre competition livery and schooling. We have stabling for up to 6 horses in a secure gated yard post and rail paddocks approaching 8 acres a 45x25 metre outdoor floodlit arena and horsebox hard-standing parking.